Western blot analysis of untreated and UV-treated (50 mJ/cm2, 30 min) HeLa cells, using BRCA1 antibody. 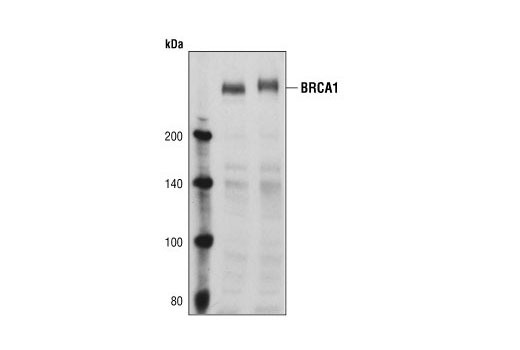 BRCA1 Antibody detects endogenous levels of total BRCA1 protein. Five human isoforms are produced by alternative splicing and alternative initiation. The nuclear isoforms 1, 2, and 4 are detected, whereas the cytoplasmic isoforms 3 and 5 are not. The antibody does not recognize BRCA2. Polyclonal antibodies are produced by immunizing animals with a synthetic peptide corresponding to amino acids near the amino terminus of human BRCA1. Antibodies are purified by protein A and peptide affinity chromatography.